Since most car reliability surveys are annual, they are rarely based on recent information. Unlike the others, TrueDelta’s ongoing Car Reliability Survey updates quarterly. The most recent update, released to the public today, covers through the end of 2013. This puts it about eight months ahead of other sources. 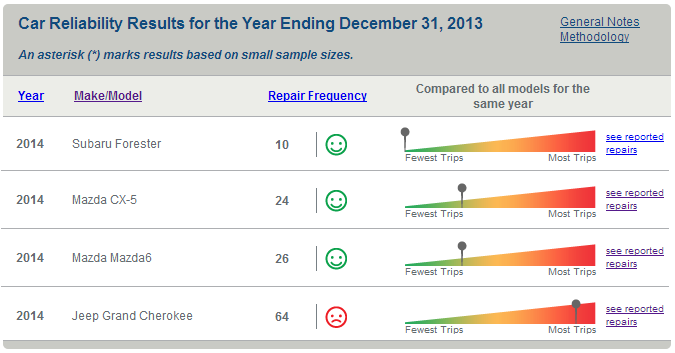 Also unlike elsewhere, TrueDelta reports repair frequencies, not just colored dots. These make it much clearer how much two car models differ in reliability. The average 2013 model required 27 repair trips per 100 cars during 2013. When you consider that this statistic includes even minor repairs, such as those for rattles, the average car today is very reliable. The averages for 2008 and 2003 model year cars were 44 and 73, respectively. Even ten-year-old cars aren’t averaging one repair trip per year. Some car owners only consider repairs that render a car undrivable to be worthy of concern. With this update TrueDelta has released a second set of statistics that include only powertrain and chassis repairs. These are only about one-third of the total for 2013 models. Powertrain and chassis repairs are rare during the warranty period. But such repairs increase as cars age to become 64 percent of the total for 2008s and 75 percent of the total for 2003s.